Water Temps: Surprising cold for this time of year. # of fish caught: Didn't really pay attention. Guessing 6 Kern River Rainbows, 5 Golden Trout and probably 6 Little Kern Golden Trout. Set Up: 7'0" Fast Action Cane Rod W. Cattanach 704-3 made by yours truly (rod #6), 7.5ft 6x leader and 6x tippet. What do you call it when you catch all three species of Kern River trout in a single day? I call it a Kern Slam! I did a kamikaze trip down to the Kern and it tribs on Saturday. I left the house at 3:45am and was in bed by 11:30pm. Total fishing time was probably about 2.5 hours but it was worth it. I fished some new waters, visited a part of the state that I’d never been to and caught 2 new sub species of fish. After traversing the horrendously windy HWY 155, I arrived in Kernville about 10am. 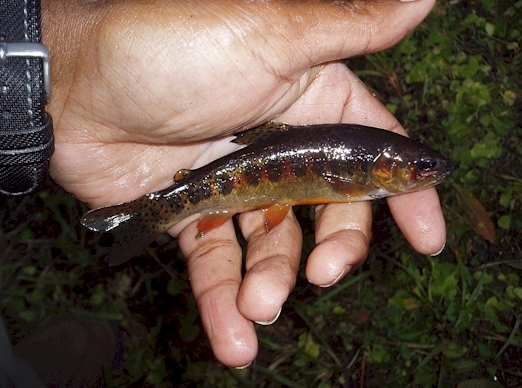 I wanted to catch one each of the Kern River Rainbow, South Fork Kern Golden Trout and Little Kern Golden Trout for the Heritage Trout Challenge and I planned to do it in a single weekend. I had all my camping gear with me and enough food for an extended stay but with any luck I’d be able to catch each fish and head home on the same day. It would be a nice surprise for Vita and allow me to spend Sunday in the shop making rods. That said, I didn’t want to feel that this was a hectic trip or that I wasn’t fishing or more importantly enjoying fishing. I didn’t drive 6hrs to make myself miserable. Fortunately, it doesn’t take much to satiate my fishing desire and given the beautiful terrain, I was sure I would enjoy myself. I’d done quite a bit of homework for this trip and had targeted several road side streams that I could. The first stream was a tributary to the Kern River and one were I thought I could find a Kern River Rainbow trout untainted by the planters in the main stem of the river. The road to the creek was steep and my car’s tires slipped in the dune like sand. At the top,there was a small sand mound and for a split second my front wheels felt like they were dangling in mid air. Sand was a new experience for me. The car bottomed out but had enough inertia to carry me over. I arrived at the stream very quickly and if this was a sign of things to come, it would be a good day- fish or no fish. 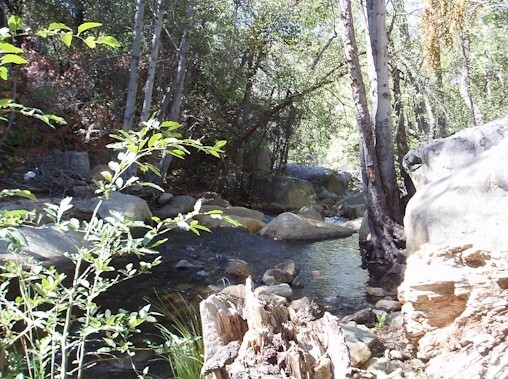 I imagine the stream and the general scene were fairly typical of southern California streams like those in the San Gabriel Mountains. Slip rock lead to and surrounded the stream. The rock had been polished by years of run off and was smooth and slippery. The stream was steep and shaded but not particularly brushy. The rocks provided plenty of pockets and plunge pools and the larger rocks provided plenty of cover for me. My casts to the first pool were ignored. I hid behind a tree several feet from the bank, unsuccessfully trying to get a good drift. I had decided early on to only spend an hour at this first stream and so I quickly moved to the next downstream pool. A small fish took my next drift almost immediately. The cripple caddis pattern I used has long been one of my favorites and I was glad to see that it hadn’t lost its magic. I made several more drifts thought the pool and the fly was taken again and I missed the strike. I moved a bit further down stream, climbing around and sliding down a large rock. This pool was much larger. Water swiftly plunged in to the pool from between two large rocks and formed a chute which was small enough to hop over. This narrow, deep channel opened up into a deep pool with a small rock in the tail. I made several casts with my dry fly, letting it drift in length of the pool. This was a really fishy pool and when the dry didn’t work in short order, I didn’t hesitate to tie on a Dark Lord with a Gold Ribbed Hare’s Ear dropper. My first cast into the soft water behind a rock was taken and was met it with a late strike from me. The fish darted away, leaving the top of the pool empty. I hopped over the chute to the other rock and sat for a while watching the stream. From that particular vantage point I could see several fish in front of the rock at the tail out. They were facing away from me! This was interesting. Fish only face backwards when there’s a back eddy and there didn’t appear to be one on the surface. There must have been something about the force of the water coming through the chute and the shape of the back of the pool that created an underwater back eddy and a layer of water which flowed back toward the plunge while the surface water flowed through the pool seemingly unmolested. The water was clear and I could clearly see two fish, more importantly, I could clearly see my Dark Lord as it drifted through the pool. The flies weren’t getting deep enough and the fish didn’t seem eager to move to them. You wouldn’t think it but it was a tricky situation. The fish were holding along a seem facing the opposite direction of the current I was casting into. They key was to get the flies deep enough so that they would drift past the downstream current and drop into the deeper, upstream current. A heavier nymph would solve the problem but I don’t generally carry split shot when fishing small streams. It took some trial and error but I was eventually able to get several good presentations, each was eagerly accepted and I landed my first Kern River Rainbow Trout. I could no longer see any fish in this pool so I turned around and worked my way back upstream. Again I fished the pool where the fish took my cripple caddis. I dropped my Dark Lord into the pool and this time I hooked a larger fish than before. I made several casts which resulted in one missed strike and two lost flies and then hopsctoched to the larger pool above. This was prime trout water and as I crouched along side a wall of slick rock, I could easily see 4 or 5 fish holding in the shallow tail. 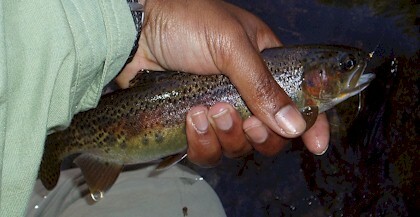 The bigger fish was in the center and as I tied on a new fly, I looked up periodically to make sure it was still there. I tied on an untried fly that I had decided to tie from a fishing magazine. It’s a sort of Peacock and Starling with a beadhead and yellow tag. I don’t remember what it was called but it sure looked good so I thought I’d give it a try. I botched the first cast and instead of the fly landing in the center of the pool, in front of the bigger fish, the fly fell short and to the right, it was slammed by a smaller sentinel fish. The sentinel fish sent the larger fish scurrying for cover. I allowed the pool to rest just long enough for several fish to return. I made several additional casts, again releasing several more fish. By this time I was close to my 1 hour fishing time allotment and having so much fun that I was seriously tempted to stretch that hour an extra half hour, which probably would have stretch into an additional half hour or longer. Fortunately, the next two events convinced me to move on. First, I made a cast to the side of a rock at the head of the pool and the largest fish of the day accepted my newly christened fly. I took a few pictures and eagerly made another cast. I was a little too eager and this next cast landed in a tree on the far side of the pool. I was at a cross roads. If the fly had pulled off the tree freely, I surely would have spent more time at this stream than practical. It didn’t and decided to move on. 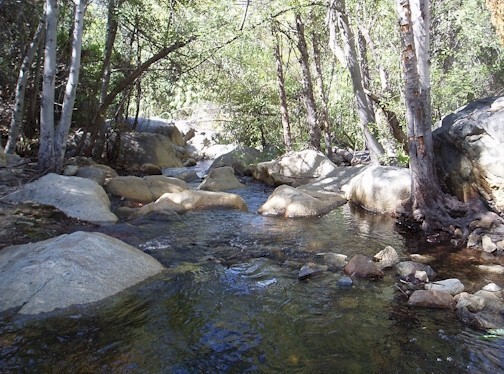 The next stream I planned to visit was on the west side of the Sequoia National Forest. It was a South Fork Kern trib and along the way I was treated to pleasant views of Mts. 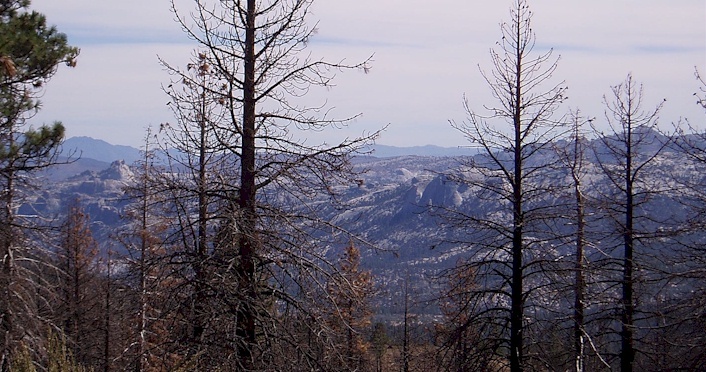 Whitney, Langley and Olancha as well as the Domeland Wilderness. The drive west took me longer than I had anticipated and I arrived at the next stream “behind schedule”. The map showed that at several places, the road followed the stream and that all that was required was a short hike through a neighboring meadow. I pulled over at the first pull out and scurried across the meadow. The stream and its meadow were reminiscent of the meadow stream that gave me so many problems in my search for Warner Redband Trout. It was mid afternoon and I knew that I couldn’t fumble around the stream as I did then. I needed to find fish fast and catch them. I couldn’t really see the stream because of the scrub and brush but I could hear it. I decided to listen for fast water. Gurgling fast water most likely meant pools and pockets, deeper water and more fish. I followed my ears to the stream and was treated to a nice little pool, pocket water, riffle combination- a perfect place to catch fish. From the high bank I could see several fish in the tail of the pool above me. I inelegantly crashed down the bank to stream. A few fish in the pool scattered and I was sure that I must have spooked the fish in the slow pockets beside me. If I hadn’t spooked all the fish, than I very definitely spooked the larger fish. I rested the pool a bit as I tied on my fly. Again, I went with the Cripple Caddis. In the high country and on small streams, I like to start off with a dry, even if I don’t see surface activity. If I don’t see any action, I figure I can always go deep with little fear that my poorly drifting dry fly overly spooked the fish. I don’t think I could say the same of the reverse scenario. I don’t think I could effectively fish a dry after spooking the fish with an atomic nymph. I cast in and around the rocks that formed the small stream breaks beside me and landed a few small fish. I took a few pictures and moved to the larger pool up a head. 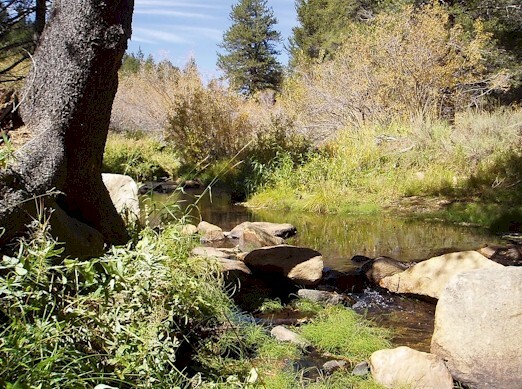 I’ve caught many California Golden Trout and wasn’t going to spend too much a time at this particular stream. Especially if the stream turned into the trouble maker I predicted it would. I didn’t need the aggravation and I had one more fish to catch. When I landed and photographed a larger fish, I jumped up the bank and jogged back to the car. I broke the bamboo rod I was using down and set it in the boot below the rear windshield. I was off to the next stream, this one on the far eastern side of the forest. I back tracked my original route, crossed the Kern River at the Johnsondale bridge and continued further east. If I reached the last stream by 5pm, I could probably catch a few fish and be home by midnight. If I failed to catch a fish, I’d spend the night and drive home the next afternoon. 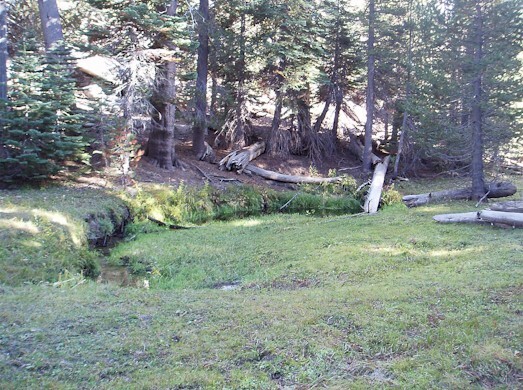 The last stream was a tributary of the Little Kern deep in giant sequoia country. This stream was vastly different than the others. The first stream flowed down the side of a steep, dry canyon, the second, meandered through a wide grassy meadow, this last stream snaked its way through a shaded meadow in a forest more suited to the Pacific NorthWest than southern California. The forest was moist with moss and woody debris everywhere. The stream was extremely dark, the rich dark soil surrounding it mixed with fallen timber stream side to form log jams with pitch black holding water. This stream was the smallest of the three, a gutter stream really which I could easily straddle in places. Like the other streams, I had picked this stream based on my research to determine which streams held relatively pure populations of trout. I had picked specific fishing locations based on their proximity to the road. This was the only stream in which the prospect of hiking was a real possibility. It was more difficult to pinpoint than the others. A road side stream, the road crossed it at its extreme headwaters; it was almost invisible and would go unnoticed by anyone that wasn’t specifically looking for it. Fortunately, I had punched into my GPS the coordinates of where several springs joined the stream and a short hike had me at fishable water in no time. When I arrived at the stream, the camp sites and near by woods where teaming with hunters. Several of these hunters I’m sure were treated to a fine version of the song Crawfish from the Elvis movie King Creole as, not wanting to be mistaken for a deer, I broke out into loud song whenever I heard rustling in the woods. Again I tied on the Caddis Cripple and landed a small fish. The stream ran very slowly and though dark, was very clear. The stream was a kaleidoscope of small grassy runs, undercut banks and fallen timber. I decided to dap nymphs along the bank and put on a Prince Aggravator. Dapping the Aggravator worked very well fishing for redbands on Trout Creek and I figured it would work equally well here. It did and I had determined the larger fish size on this stream at just over 6 inches when a 13 inch fish rushed the fly from an undercut bank. It turned away at the last minute but with a little patience and a little coxing I managed to convince the fish to strike again. This time it was fully committed. It swooped from under the bank, grabbed the large bead head nymph and headed for cover. I struck and felt the slightest prick as the fish ducked for cover. Without any larger flies to tempt it with, I decided to call it a day. My journey to this stream had put me on a road straight to highway 99. This was a pleasant surprise as it meant that I didn’t have to make the hour plus drive back to Kernville or navigate the curves of HWY 155. This new route made for a more pleasant and scenic drive and once again took me a new part of the state. The journey complete, I headed toward familiar roads and home.